Whoever you are and wherever you find yourself on the journey of faith -- you are welcome here as you are. New Salem offers children, families and adults a Christian education at ALL levels through worship services, milestone celebrations, Sunday School, Confirmation, and Bible Study. Sunday Morning Worship Services (9:30 a.m.): Our Sunday morning worship brings us together as a diverse, cross-generational and inclusive community of faith to give praise, pray, learn from God's word, celebrate milestones (such as the Blessing of the Backpacks and Presentation of Bibles to our 3rd graders) and the sacraments of Communion and Holy Baptism. Sunday School & Faith Discovery: Sunday School for ages Pre-K to Grade 6 will follow Communion during the 9:30 a.m. Sunday morning worship service. Children will learn of God's love for them through Bible stories, fun activities, and caring relationships. Our teachers are excited about making each Sunday School session extra-meaningful for our youngsters. On Wednesday evenings, our Faith Discovery program is an opportunity for everyone to share a meal and grow in faith together. Wednesday, March 13 – Supper at 5:30 p.m. followed by Faith Discovery lesson and activities at 6 p.m.
Wednesday, March 27 – Supper at 5:30 p.m. followed by Faith Discovery lesson and activities at 6 p.m.
Monday Morning Bible Study (9:15 a.m.): This course delves into the Bible passages presented at the subsequent Sunday worship service. It invites participants to deepen their spiritual lives and live as disciples of Jesus Christ. "Gather" Bible Study (9:15 a.m.): This course is presented every other Thursday (see current month's calendar for specific dates). Study materials will be provided and there is nursery care available. Just as Jesus called his first disciples, we too, invite you to “come and see” (John 1:39) us here at New Salem Lutheran Church. All are welcome; we hope to see you soon! New Salem Lutheran Church is a place for children, youth and adults to hear the Bible story and to be reminded of their identity and belonging as God's child. It is a place for us to grow in the knowledge of God's love. It is a place where we use and discover our gifts as we learn how to be disciples of Jesus. Please visit the "ministries" page where we share the opportunities available through New Salem's faith community. We are guided by the Word and our Mission Statement and Guiding Principles. We are located at 7491 Island View Drive NE, Turtle River, Minnesota. To find us please use our map. 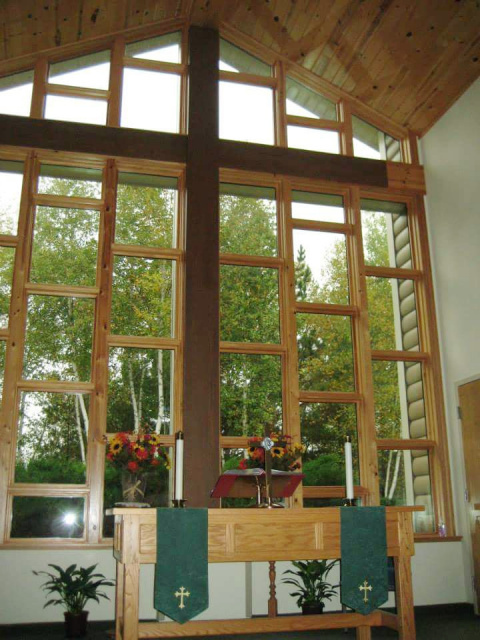 Our congregation is part of the Evangelical Lutheran Church in America, ELCA, Northwestern Minnesota ELCA Synod. Our telephone number is 218-586-2262 and email is newsalem@paulbunyan.net.